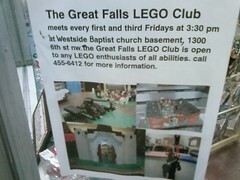 Did you know that there is a Lego Club in Great Falls? Can’t remember where I saw this sign, but I hope that it isn’t old and that the Lego Club is still around. According to this flyer, the club meets the 1st and 3rd Friday of every month at 3:30 pm in the basement of the Westside Baptist Church. Call 455-6412 for more information. By the way, did you know that there Lego Professionals? Still around. Many of the Lego projects at the fair are made by Lego club members. Lego is such a terrific toy – not just meant for infants but as well older people!